Contact your City Council member to let them know you support the revised proposed Vacant Property Registration Ordinance at the November 17 City Council Meeting. The ordinance requires certain property owners to register their vacant and abandoned properties. The revised ordinance does NOT require financial institutions holding mortgages to register unless the institution has re-gained full title to the property through foreclosure or a deed in lieu of foreclosure. This means that some financial institutions will continue to hold “Zombie Mortgages” where they refuse to foreclose because they don’t want the property back. On Tuesday, OTOC leaders will call on the Nebraska Bankers Association to assure our community that none of their members engage in Zombie Mortgages, as they asserted at the Oct 6 City Council meeting. OTOC leaders are investigating other means to assure that national and international banks are not allowed to delay on foreclosure indefinitely, while the abandoned property deteriorates and is a blight to all neighbors. On October 6, when Council President Ben Gray opened the public hearing about the Vacant Property Registration Ordinance, he stated that OTOC had taken the lead in organizing proponents for the ordinance so he would let OTOC leaders determine of the order of who spoke to the Council. Susan Kuhlman and Gloria Austerberry of the OTOC Housing Action Team led off the testimony and they were followed by Professor David Weber of Creighton Law School and Shaun Iluah, General Counsel for Habitat for Humanity. 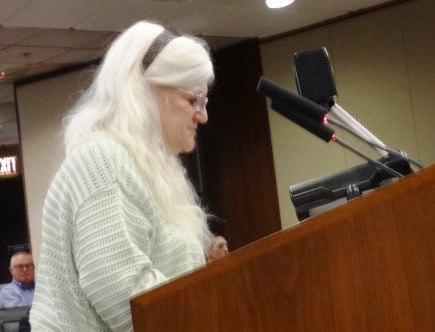 All of their testimony indicated there is a great need for the City Council to pass an ordinance requiring the registration of vacant, neglected and abandoned buildings. 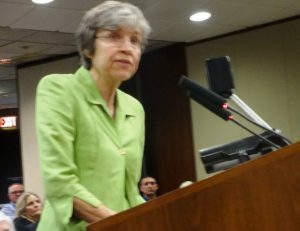 Susan Kuhlman stated the “deterioration pipeline” of 3,000 to 4,000 properties that are slowly headed to demolition must stop. Gloria Austerberry testified that most of the properties on the demolition list are there because of: (1) irresponsible landlords who use up and then abandon their rent properties; (2) Zombie Mortgages held by financial institutions who file for foreclosure but never complete the process because they don’t want responsibility to maintain or dispose of properties in low income communities; and (3) properties where the heirs don’t sell or dispose of the unwanted property of the family members. Five opponents testified in opposition to the ordinance including two from the Metro Omaha Property Owners Association (MOPOA) and one from the Nebraska Bankers Association. All of the opponents recognized the city has a serious problem with abandoned and vacant buildings, they just don’t want the ordinance to apply to their members. City Council decided to delay final vote on the ordinance until November 17 so that interested parties could discuss how to make any needed improvements to the ordinance. The Omaha World Herald correctly reported “[S]upporters from the Omaha Fire Department, North Omaha Neighborhood Alliance, Omaha Together One Community and other groups told the council that the ordinance is long overdue. Television media also covered the story and you can follow these links to see OTOC and other community leaders in action at the two hours City Council meeting. Not only are these run-down properties an eyesore, they are also dangerous – especially to first responders who have to deal with the neglected properties when there is an emergency. OTOC believes this ordinance will require owners and financial institutions with a lien interest in vacant, abandoned properties to register those properties and to pay a $500 registration fee every 3 months that the house remains in that condition. Properties that are listed “for sale” or that are actively being repaired are exempt from the registration requirement. This will be a strong incentive for the financial institutions and owners to take some affirmative action to dispose of their property. *encourage owners and banks to take timely action to sell, donate or demolish properties that they longer want. *save tax payers money from being used to demolish properties that deteriorate. Contact Gloria Austerberry at glauster@yahoo.com or OTOC at 402-344-4401 to learn more about how you can help support this ordinance.